Tricia serves as a support and facilitator to the 26 families whose loved ones were killed at Sandy Hook School on December 14, 2012. Tricia’s 6 year old son Jack was one of the children who died that day. Tricia has a Juris Doctor from Quinnipiac University School of Law and a Bachelor of Science from Pace University. While her position at the Center for Wellness and Support is not in a legal capacity, her legal training and first hand experience as a bereaved mother living with traumatic loss offers the combination of skill and sensitivity when providing support to the families of loss.She currently serves as a member on the Sandy Hook Permanent Memorial Commission and is also a co-creator of the family based website mysandyhookfamily.org. Tricia lives in Sandy Hook, Connecticut with her husband and teenage son. She enjoys spending time with her family, traveling and reading. Valerie has a Masters of Arts Degree in Marriage and Family Therapy from Fairfield University and a Bachelor’s of Science in Psychology from Union College. Valerie is a member of the American Association of Marriage and Family Therapists and the International Association of Trauma Professionals. She has completed the coursework for her School Certification and has completed both Part I and Part II of EMDR Training. Valerie has extensive experience in substance abuse, behavioral health and domestic violence. She has both experienced and witnessed, the devastating results of trauma in her family of origin and as a community member of Sandy Hook. She views trauma though a systemic lens and understands the importance of working with the entire family when focusing on recovery in order to facilitate post-trauma growth. Valerie lives in Sandy Hook Connecticut with her husband and twin girls. Valerie is building her professional practice in the areas of Fairfield, Trumbull, and Monroe. Prior to her career in mental health, Valerie had a career in Real Estate law as a Title Closer and Retail Operations with Cartier, Inc.. In her spare time, she enjoys being with her family, playing tennis, photography, participating in Barre classes, playing piano, listening to music, and traveling. A native of the Danbury area, Corinne Ofgang received a Master of Science degree in Clinical Mental Health Counseling at Western Connecticut State University. Her undergraduate degree is in the Social Sciences, with a concentration in conflict resolution from the same university. She is currently pursuing a PhD in Health Sciences. Prior to joining the Center for Support and Wellness she worked as a clinician at a local substance abuse and behavioral health agency in Connecticut. In this capacity, she was responsible for facilitating psychoeducational and therapeutic support groups, as well as comprehensive assessments and individual counseling for clients with co-occurring conditions. 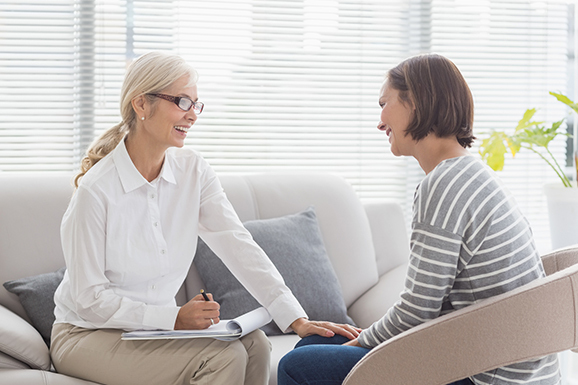 She is known for a warm, relaxed, and comfortable approach to counseling and is a professional member of the American Counseling Association and the Connecticut Counseling Association. Corinne believes in treating all clients with unconditional positive regard, and works to understand their struggles through a trauma-informed lens. Corinne’s favorite activities outside of work are hiking and spending time with her husband, family and Labradoodle, Iris. Care Navigator – Persons in distress, seeking support and referral, are best served by a professional who can assess, inform, guide, monitor, perform quality assurance checks, and more. It is not enough to point a needy person in the right direction; walking with that person on the journey through help is a much more productive and effective strategy leading to better outcomes. No one should have to feel as if they are alone. This is how the role of Care Navigator serves our clients. • Respond to inquiries from residents, employees, concerned family members, police and fire personnel, clergy, hospitals, and area behavioral health agencies. • Provide further case management services when needed. Survivor Care Navigator – Funded by the Office of Victims Services, this position serves as a point of contact for all survivors and those responding to Sandy Hook Elementary School on 12/14/12 (including staff, students, first responders, and their families). This position can help clients find funding, navigating insurance claims, behavioral health referrals, and other individual needs. Clients in this population can utilize this position for other concerns not related to 12/14/12. Victims Family Care Navigator – Funded by the Office of Victims Services, this position serves as an advocate for the 26 families whose loved one is a victim of the 12/14 shooting. This position helps families with their individual needs. In addition, this position communicates to the families on a monthly bases and shares relevant town, state, and national information as needed. Clients in this population can utilize this position for other concerns not related to 12/14/12.